This week I'm keepin' it classy with some inspiration photos that I've come across over the past week. I yearn for this kind of inspiration - it allows my mind to dig for creativity & hope. Pinterest & The Magnolia Journal are my go-to's for inspiration. But I am realizing more and more that I am inspired by things that may have nothing to do with what I'm seeking inspiration for. Such as; nature, children, books, prints, clothes, food, etc. I love digging deep to wait for that little trigger to go off in my mind or heart! What gets you inspired? I have been day dreaming about designing a cute cafe like this one. The colors are so yummy. Possibly in NY. Now thats dreaming hard. But it doesn't hurt to imagine what could be! These darling baby jumpsuits are killing me. And making me baby hungry (haha). I love these colors - I can only wonder why....(Alika's colors). The soft pink and delicious green. I love them for just about anything - floral arrangements, clothing, pillows, a nursery. 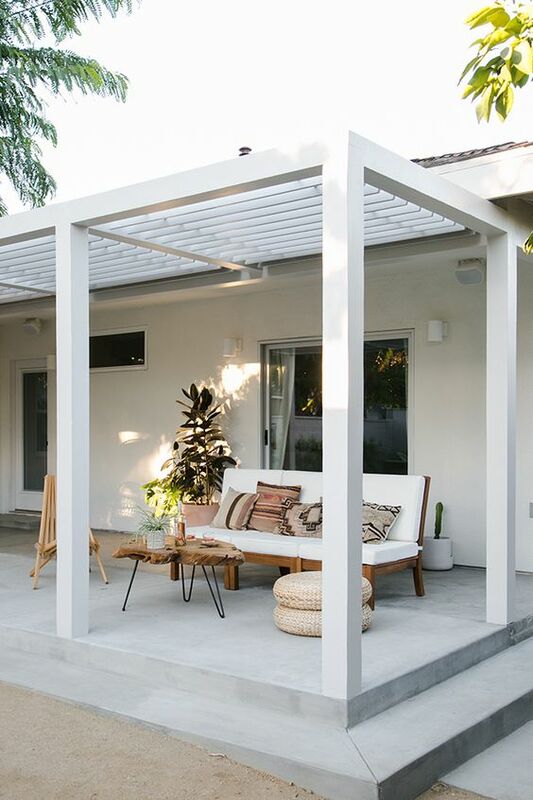 Now, this pergola is the perfect amount of simplicity. It is so inviting and looks like a bucket of love got poured all over it and I'm loving it. Can you imagine spending all of your summer nights out there? Dreamy. And last but, not least - the thing in this room design that is grabbing my eye is that ottoman! Its gorgeous. The fabric itself is killing it. This design explains why ottomans are necessary & how they add a finishing touch! I hope you've been inspired by these photos as much as I have! Until next week -- what would you like to see more of? Tips/tricks? Life? Projects? How-to's? DIY? Leave a comment, I'd love to hear!